If there was one big winner at last night's Grammy Awards that was even more surprising than Daft Punk getting Album of the Year, it was Arby's scoring the tweet of the night. The sandwich chain's post about Daft Punk collaborator Pharrell Williams' sartorial selection ("Hey @Pharrell, can we have our hat back?") was a responsive-marketing coup de grâce, with 75,000 retweets and more than 40,000 favorites by Monday morning. 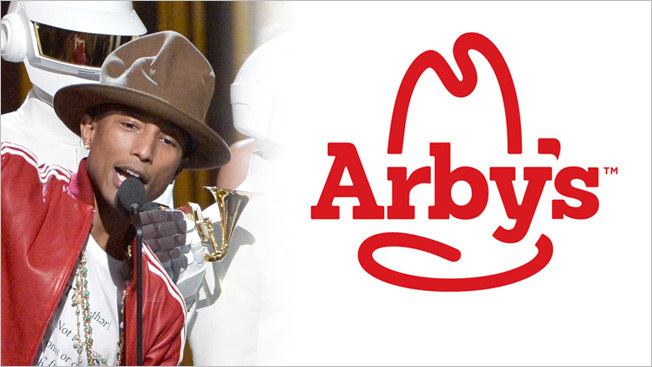 To be sure, jokes about Pharrell's hat, which looked borrowed from Smokey Bear, had been flying around Twitter for more than an hour before Arby's made its post. But man, what a post. Many marketers attempted to tie their brand messaging in with the Grammys, but as you can see in Digiday's roundup, few succeeded. Arby's even merited praise from global brands like Pepsi and Hyundai, which is an odd new level of meta marketing. But when it comes to responsive marketing to celebrity antics, the best a brand can hope for is a response from A-lister him- or herself. And that's exactly what Arby's got in the early hours of this morning, when Pharrell asked on Twitter, "Y'all tryna start a roast beef?"